Metalite has undertaken many MOSKIT demonstrations worldwide for military end users who have a requirement for portable airfield lighting. 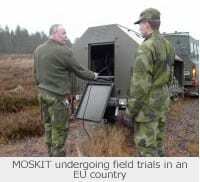 A MOSKIT, and additional ORELS, can be sent to a country and with the support of a Metalite employee the system can be deployed to relevant military personnel such as Air Traffic Controllers, Airfield Operations personnel, Pilots and Engineers. The potential customer can undertake flight trials with fixed or rotary wing aircraft. Such trials have been undertaken in over 12 countries and have lead to 10 military users placing orders for MOSKITs and SALKITs.